Diesel Fuel | Virent, Inc.
Diesel is a widely used petroleum distillate fuel that is in high demand around the world. As more and more cargo is moved by road, the traditional use of diesel in heavy goods vehicles is increasing. In addition, diesel is fueling more and more light passenger vehicles as people switch to diesel cars for better fuel efficiency. In some European countries today, the majority of new cars sold are powered by diesel engines. Automobile companies, commercial shipping fleets, rail operators, metropolitan transportation agencies and manufacturers of heavy equipment and military vehicles are just some of the sectors seeking to adopt sustainable diesel fuel alternatives. Virent’s patented technology enables the production of diesel fuel from bio-based feedstocks. Our BioForming® process produces industry-ready molecules for high-performance diesel fuels. 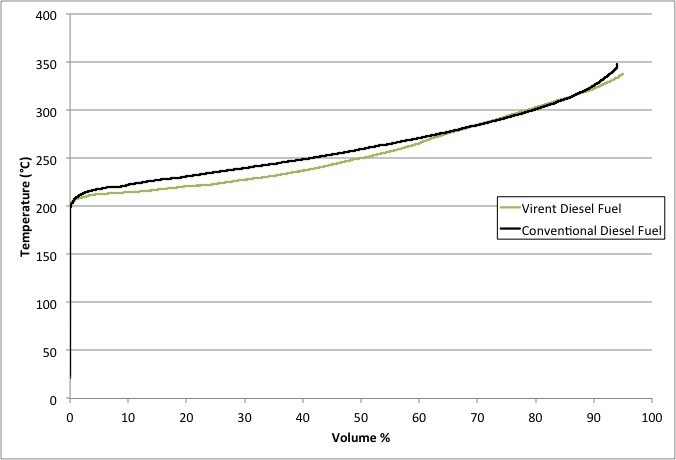 Our technology uses a wide variety of both cellulosic and conventional plant sugars, providing an economical route to sustainable bio-based diesel fuels that are identical to their existing petroleum-derived counterparts as shown below in these boiling point curves. Because of these similarities, Virent’s diesel fuel can be “dropped-in” to existing petroleum refining infrastructure, such as pipelines, tanks, pumps and heavy equipment engines of all kinds, offering sustainable diesel fuel without additional manufacturing investment and uncertainty. The abundance of cellulosic and conventional plant sugars allow for significantly higher commercial volumes and lower feedstock cost compared with seed oils, jatropha and other lipids. The chemical properties of our diesel fuel meet or exceed all the key requirements for petroleum-derived diesel, with comparable cetane, below detectable levels of sulfur, and superior performance at cold temperatures. These properties are achieved without an isomerization/hydrocracking step, which results in a yield loss in other technologies. Virent can produce the sustainable, high-performance diesel fuel you require.